The athletics track services we have to offer can help ensure that your school, club or leisure centre has a great quality sports facility which is safe and suitable for use over a long period of time. One of the services we provide is full construction and installation of surfacing in a range of different specifications. This could include athletics running tracks, long jump/triple jump runways and sand pits, and high jump facilities. We’d be happy to talk through everything you need and come up with an idea of the costs. Feel free to get in touch with us via the enquiry form on this page and we’ll get back to you as soon as we can. Just be sure to include details of the project like your location and the area size for the proposed works. 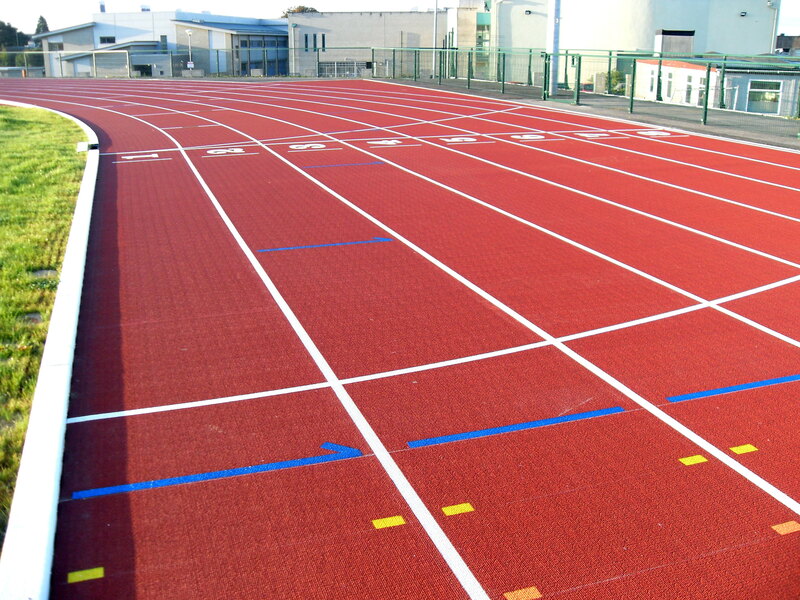 These athletics runways can be installed in a number of surface specifications. 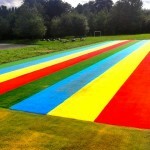 These include the traditional polymeric rubber or an alternative needlepunch synthetic turf surface. The synthetic carpet is popular with primary schools as it provides a softer landing surface for younger children. 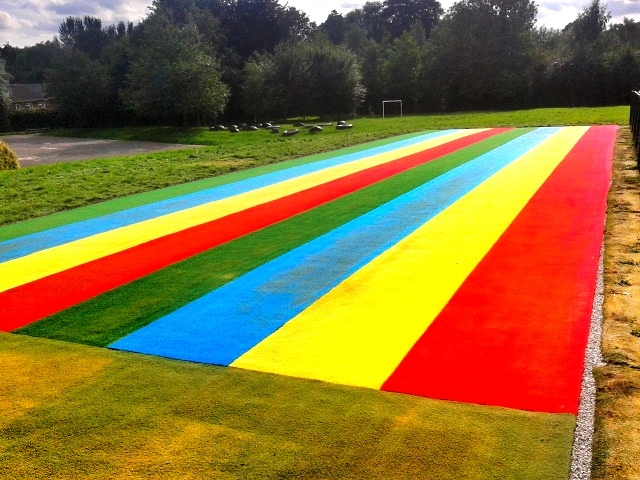 Needlepunch artificial grass surfacing can also be installed in a range of bright colours which makes athletics even more fun for kids. 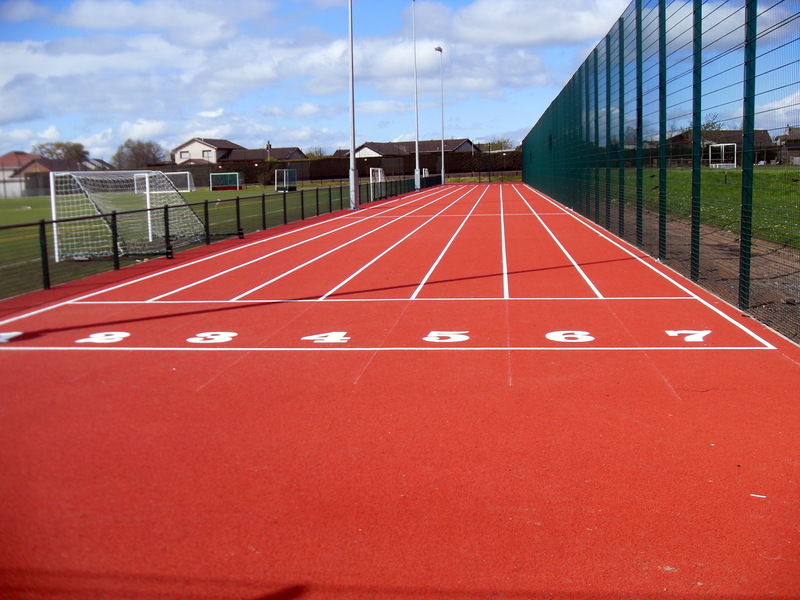 We can install the athletics track surfacing to meet a range of dimensions, specifications and budget requirements so you can have complete control over the whole project. These services could be carried out for a recreational facility at a school, or even a professional standard club running area. Another of the athletics track services we can provide is a regular cleaning and maintenance programme. It’s important that you keep athletic tracks and long jump facilities well maintained once they have been installed. This will ensure that the sports surface has the best performance characteristics and is safe for athletes to use, as well as helping to extend the product life of the surface. A variety of methods are available when it comes to maintaining a sports facility like this. 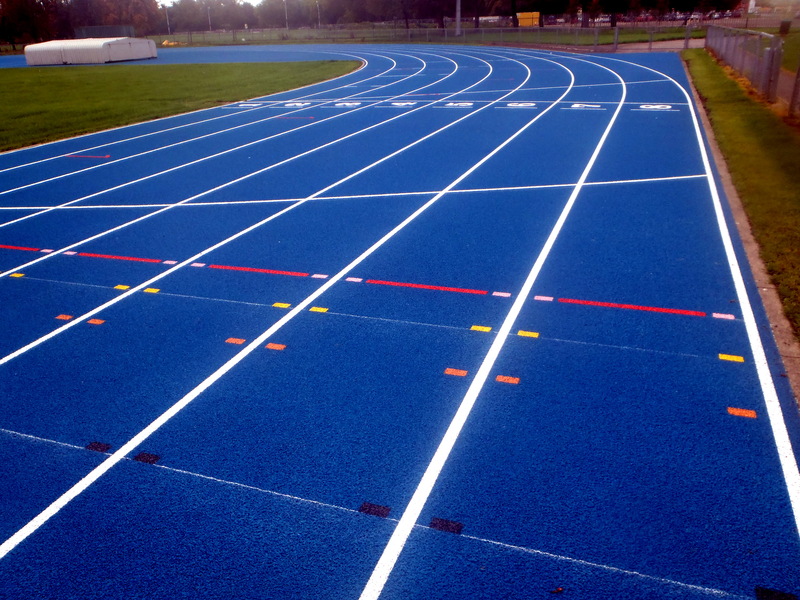 Athletics track cleaning can be as simple as brushing and jet washing the surface to remove any dirt and debris which can contaminate the area and prevent water drainage. If the sport surfacing becomes damaged or worn due to over use or vandalism, it is necessary to carry out repairs as soon as possible to prevent that damage from getting worse and making the facility unsuitable for use. If you don’t look after the surfacing properly, it might become damaged over time due to excessive wear. When this happens it could require athletics track repairs to rectify the problems and restore the playing qualities. This can consist of fixing rips in synthetic carpet surfacing, or filling in cracks for a polymeric rubber track. It is advise that you have these done as soon as possible after noticing the damage to prevent further costs. 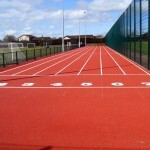 Anyone looking to have a completely new running track installed will need to think about the different surface types and specifications. We are able to provide a number of design options so you can choose the perfect one for your organisation. The athletics track construction work involves setting out a suitable sub base first to make sure there is a stable foundation. For a small area, needlepunch turf can be laid directly onto a stone sub base, but larger areas will require a base of macadam as well. Polymeric rubber will always need a layer of macadam underneath to ensure that the surface is durable and safe. Once the groundworks are complete, we’ll install the chosen surfacing to create a seamless finish. This may be done in a range of different colours and styles to perfectly suit what you want. Additional equipment like fencing may also be supplied with athletics track services if you decide to have this for your facility. Constructing smaller sized and more cost effective sports areas is getting common throughout the UK for establishments planning to produce beginners’ opportunities. A lot of schools and colleges find it difficult to renew their sports areas for a variety of sporting events, meaning that kids can’t get involved in these kinds of sports activities. The reason for this can sometimes be due to a shortage of space outside or even a shortage of funds available at the institution. In many organisations, compact athletics facilities are being created and fitted in smaller sizes to match constrained spending budgets and to become more affordable. Additionally, they are designed to produce the FUNdamental sporting movement skills of run, jump and throw. The video above shows our team carrying out repairs to an existing sports track which had become damaged. This one of the athletics track services that we offer for many different types of facility. Whether you need proactive cleaning or reactive repairs, we’ll be able to help and give you all the advice you need. Just contact us and we’ll discuss each of the different options with you. By installing diverse sports features, kids are capable of getting involved in numerous activities for a much more diverse experience. Primary elements typically consist of things like sprint tracks, throwing circles as well as jumping run ups. Multi activity spaces are produced by building a single track; this can be utilised for long jump, relay races, hurdles and many others. In both primary and secondary schools which cannot have a full sized track, this will make a great alternative and is much less expensive and also takes up significantly less room. If an individual fully enjoys carrying out a particular event for example long jump or throwing, then they could progress onto qualified facilities inside the UK. There aren’t many facilities which are aimed at people at the beginners level, making children hesitant to get involved in sports and athletics. Many experts have advised these activities should be made available to young children from as young as primary school KS1 up to KS4. A brand new athletics model has been produced by UKA, allowing small children to gain access to sports and athletics facilities. The scheme provides academic institutions with smaller, recreational top quality features that could be made with a vibrantly coloured, fun look for young people. For organisations struggling with budget and space, the compact sports and athletics facilities produce a great solution for training simple FUNdamental skills in a range of sports. Discus circles, running straights as well as jumping runways are amongst some of the more popular aspects of these recreational surfaces. For each different project the design and sizes could be adjusted to meet all the essential requirements, creating a bespoke result. A number of customers can use a compact facility as a result of specs being so flexible and unique. 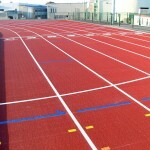 Different specifications are available including the sandwich system running track which combines two designs of polymeric rubber. Colleges, universities, primary schools as well as high schools can install these to complement current sports activity and play provision. By taking part in different sports and athletics activities, young people from KS1-4 all can build up leaning and physical fitness abilities. More young children may be motivated to participate in the new sporting activities if they have a high quality and appealing facility readily available for them to make use of. For just about any school or college attempting to keep your charges down and stick inside a budget, the compact recreational products offer an excellent option. Compact facilities help present the FUNdamentals of athletics therefore kids can develop primary skills of movement along with physical activity. UKA looks to raise desire for the sport of athletics and presenting available facilities for children is a big step towards this goal. This is generated more by holding IAAF and IPC World Championships in London in 2017. By permitting children to use the compact facilities, there is a greater opportunity for athletes to enhance their abilities and move into professional clubs as a result. As these facilities could be made to fit a range of athletics track dimensions there are no limits if you only have a small amount of outdoor space. The costs involved with carrying out athletics track services are different for each project depending on the works which need to take place. Factors which affect the price include the surfacing specification, the area size and the site location; however costs can be managed through a number of other variables to ensure that you get a quote which fits within your budget. The surface type you choose has a big impact on the costs of installing a sports facility so it’s important to decide whether polymeric rubber or needlepunch artificial turf will be the best for your project. We understand that having a full sized athletics facility built is an expensive project, so we can work with you to find a flexible price which suits your organisation and still ensures you get the best possible sports surface to meet your requirements. 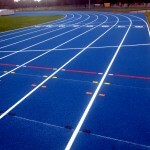 Maintenance costs for athletic tracks surfacing will also be different for each facility depending on the scope of the work which needs to be carried out. A simple cleaning and maintenance job will of course cost much less than repairs or resurfacing, this is why it’s important to have proactive maintenance done to ensure future costs are kept to a minimum. Having a regular schedule for maintaining your athletics track will help keep the performance and safety characteristics of the surface in top condition. This also provides a positive sporting experience for the athletes. Please use our contact form if you’d like to speak to use about designs and prices for an athletics track facility and we’ll get back to you with some friendly advice. Our team of specialists would be happy to provide you with all the information you need about these products. Athletic sports are very popular in schools and clubs across the UK and there is an increasing demand for new facilities. Just complete our contact form to get in touch with us and enquire about prices today. Let us know if you have any requirements for design or budget and we’ll do our best to take this into account. These facilities can be customised to fit a range of area sizes so we will be completely flexible on every project. Our athletics track services vary for every project but we’ll make sure the process suits you.